Unlike the False Oxlips (see below) that we sometimes find in many parts of Britain and Ireland, which are hybrids between Primroses Primula vulgaris and Cowslips Primula veris and can occur wherever both species bloom in close proximity, Primula elatior itself tends to replace Primroses in those regions where it occurs. Distinguished by a one-sided drooping umbel of primrose-like flowers and large leaves with abruptly-narrowing bases, the true Oxlip is a perennial and typically grows to 30cm. 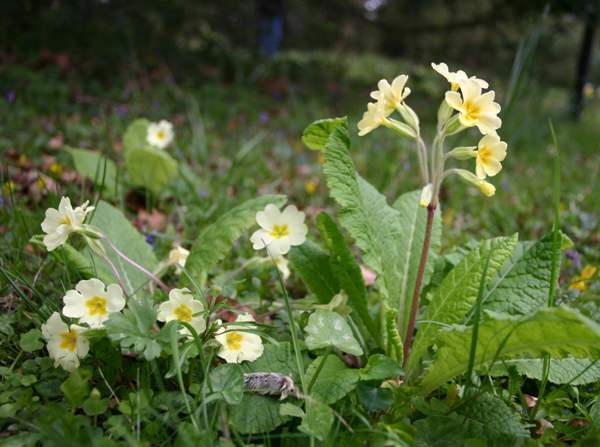 In Britain the Oxlip is now restricted to eastern England, but in mainland Europe this lovely spring wildflower is much more widespread, particularly in places where Primroses Primula vulgaris are either absent or very scarce. 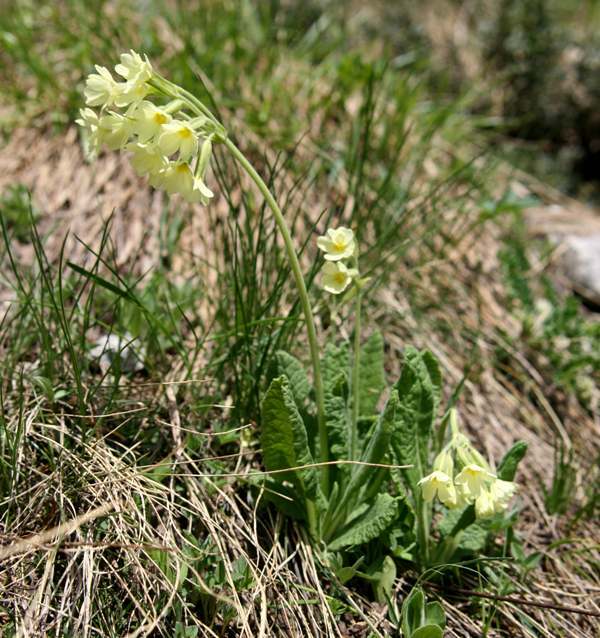 The Oxlips shown on above were photographed in the foothills of the Rhodopi mountains in Bulgaria in mid June. This lovely spring flower also occurs in Slovenia, where we found a few stragglers still in bloom on the snow line of the Julian Alps in mid June 2014. The Oxlip likes damp conditions including woodlands and woodland edges; it flowers from early spring onwards but the greater the altitude the later the flowers tend to appear. In Britain true Oxlips bloom from April to June. The specific epithet elatior means tall - a reference to the erect stature of the plants, which are usually taller than Primroses Primula vulgaris. 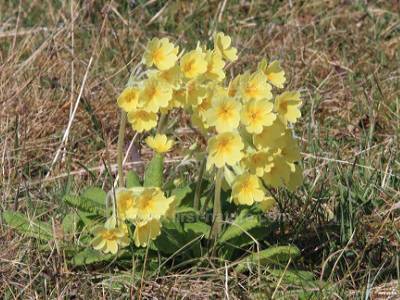 Above: False Oxlips (hybrids between Primrose and Cowslips alongside Primroses in Wales. 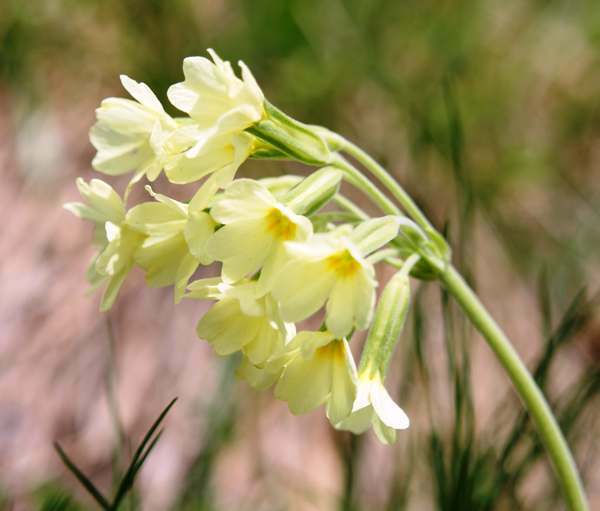 The Oxlip is the county wildflower of Suffolk, which is home to most of Britain's wild Oxlip population. Oxlips could be confused with Primroses Primula vulgaris or with Cowslips Primula veris, both of which can occur in the kinds of habitats that Oxlips Primula elatior grow in. Not strictly a species but a hybrid, the False Oxlip can look remarkably similar to a true Oxlip, although generally its umbels of flowers are not so obviously one sided. It is when Cowslips and Primroses hybridise that the resulting offspring are False Oxlips. In this example (left) from the Teifi Valley in West Wales, the plant on the left is a Primrose and on the right a False Oxlip. (Note that the umbel of flowers is not one sided.) Primroses and Cowslips were plentiful on the same slope. The False Oxlips shown on the left were found in southern Scotland. 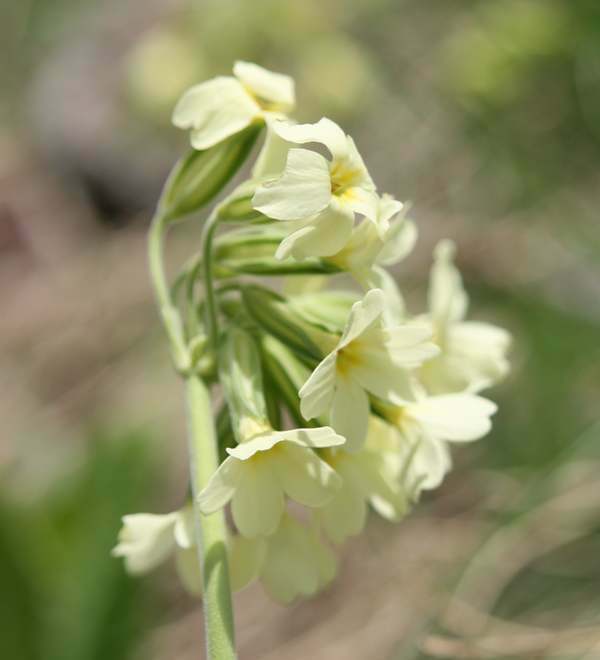 Very occasionally Primroses can also produce flowers in umbels rather than one per flower stalk, and then they too can be confused with Oxlips, especially if nearby shading or exposure to prevailing winds results in one-sided umbels of flowers.